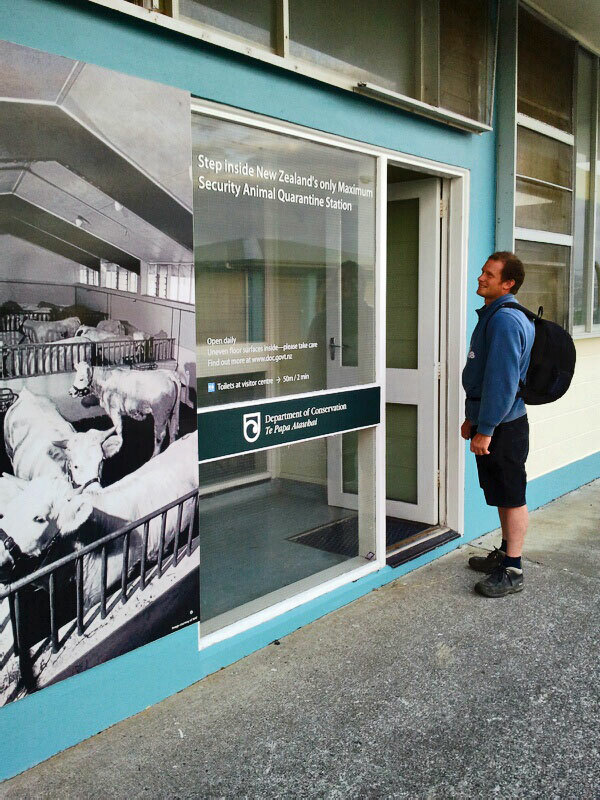 DOC Ranger Caraline Abbott discusses dogs and the impact on conservation in the Rotorua District. 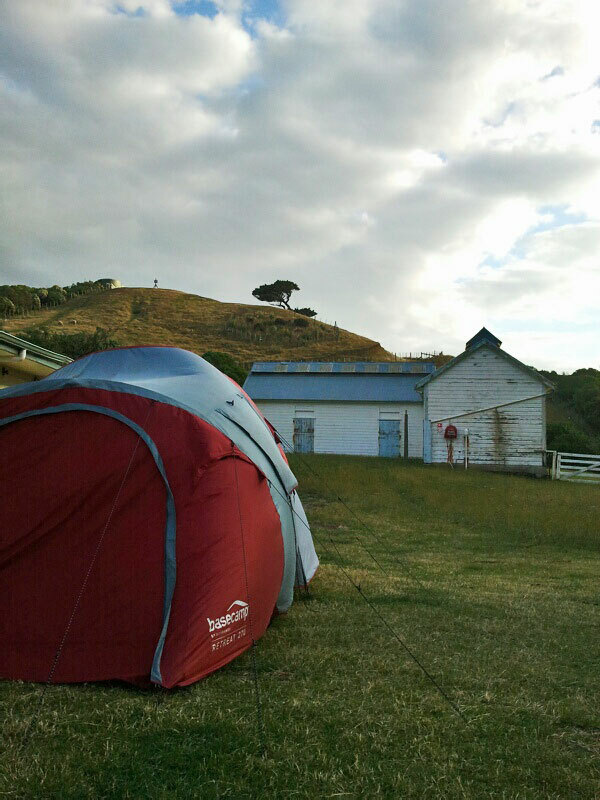 I’ve just returned from a couple of days camping on Matiu Somes Island. Not many people know that you can camp there, so everyone I told before I went over was surprised (except my colleagues at DOC of course). 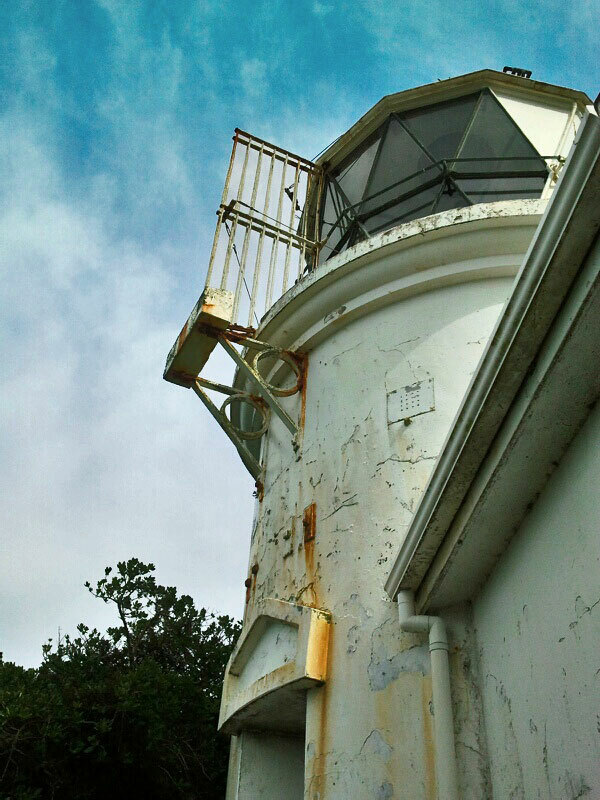 But yes, for a number of years now, you’ve been able to camp in the middle of Wellington Harbour – a short ferry ride away from the bright lights, buildings and bustle of New Zealand’s capital city. 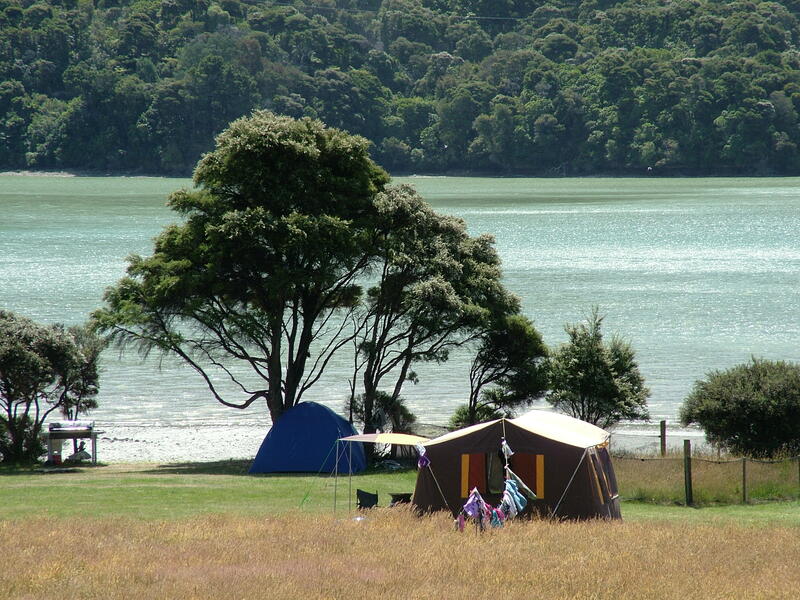 You’ve got to book this campsite in advance, so you can’t really be spontaneous, pick a fine day, and go for it. As a result, the day we went over was, shall we say, sub-optimal. In fact, as far as wind goes, it was just about “as bad as it gets” (using the words of the no-nonsense island ranger, Jo Greenman). We heeded the advice of the helpful East by West Ferry staff and took the first sailing of the morning (not my preference, but likely to be the only one running that day due to the weather). The trip to the island was more roller-coaster than ferry ride, much to the delight of the men folk in my family who enjoyed being up top and outside in the spray and splashes. We’d let Ranger Jo know when we were arriving – as per the guidance in our camp booking confirmation email – and she was there to greet us when we landed. 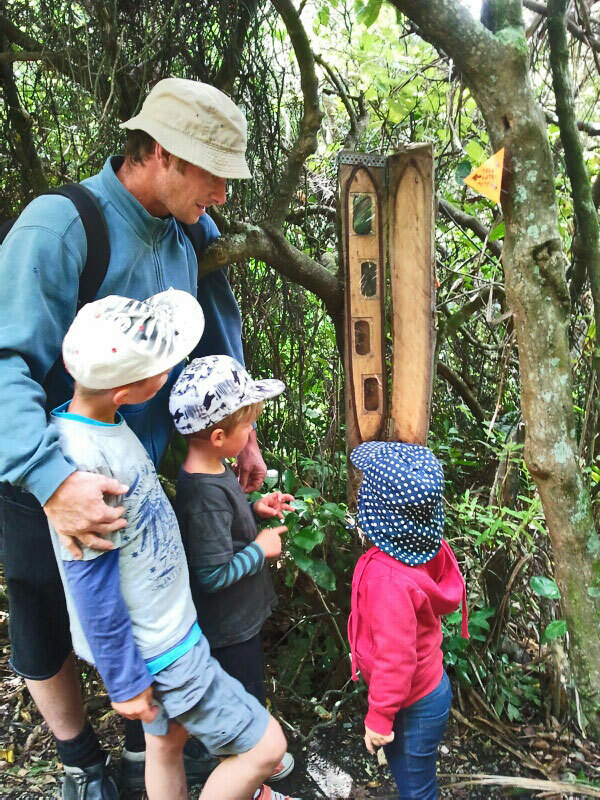 Since ship rats and other pests were eradicated from Matiu Somes (in the late 1980s) the island has become a sanctuary for native plants, birds, reptiles and invertebrates. For this reason all our gear had to be checked thoroughly on arrival, to make sure we hadn’t inadvertently bought any nasties onto the island with us. Campers are their biggest risk, says Ranger Jo, as we scrape our shoes, rummage through our bags, and unpack our tent and turn it inside out to shake the blades of dry grass from our last camping trip onto the floor of the Whare Kiore (we really needed to be more thorough with our check and clean at home – if biosecurity had been busier, and there wasn’t the time or space to sort out our tent on the island, we could’ve been sent home). Once we were given the all clear Jo gave us directions to the island’s campsite and some hints about the best place to pitch our tent so we didn’t get blown away. 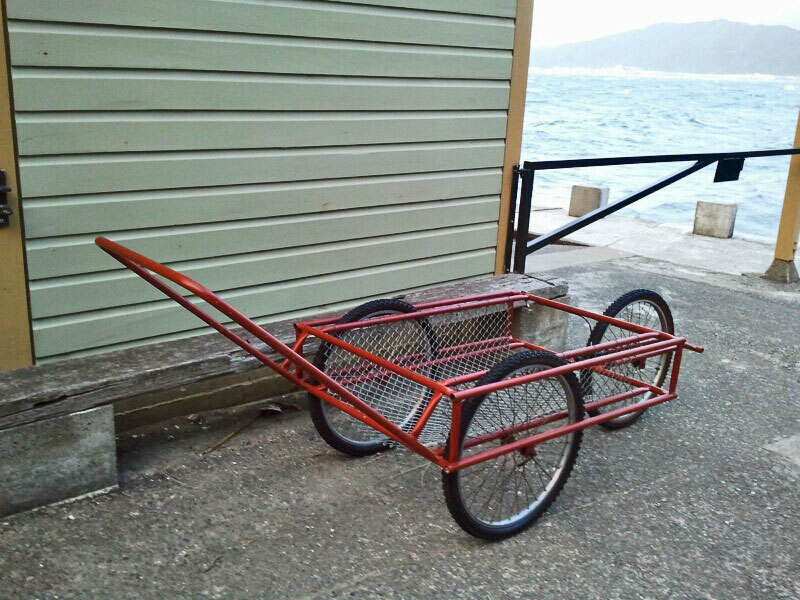 There were a couple of trolleys at the wharf to help cart gear up the hill and we used one of these to save us having to pack our tent back up after the biosecurity check. 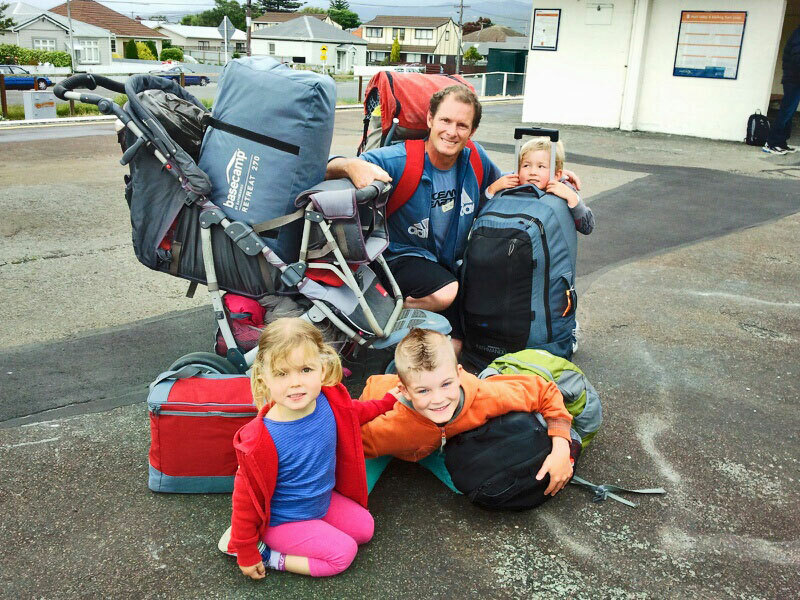 So, with packs on our backs, children in tow, and trolley full of inside out, unwieldy tent, we headed up the island to set up home for the next two days. There were no tents or signs of campers when we arrived on site. It was when I went to explore the bathroom and kitchen facilities that I met the campers from the night before – a group of teenagers packing up and getting ready to leave. 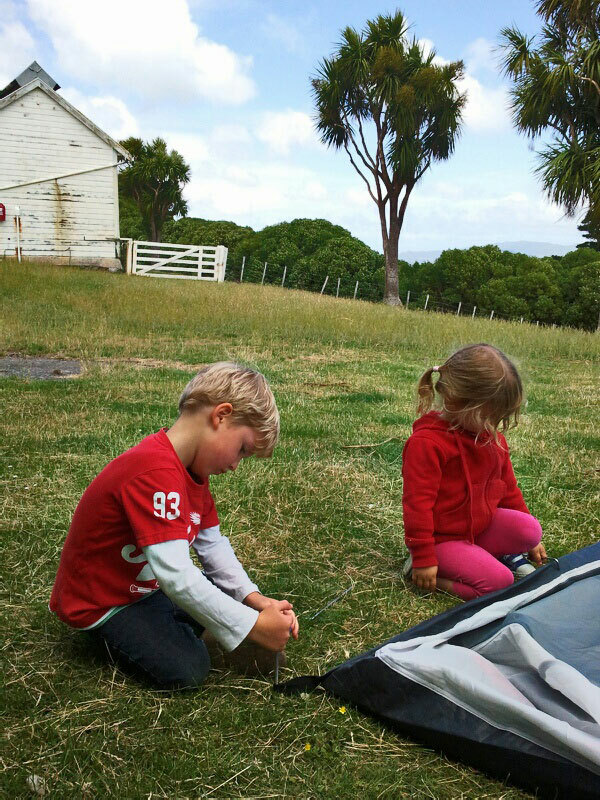 The wind had driven them out of their tent and had them camping on the floor of the small camp lounge room. Their stuff was everywhere. I’d never seen so many sugared breakfast products on one dining room table before! Never-the-less, they were very nice and, more importantly, they were leaving. I was pleasantly surprised by the campsite facilities. I’d brought a lot of stuff over that I didn’t need to. There was already clean tea towels and cloths, dish washing liquid, dishes, and pots and pans. There wasn’t just a small gas hob on a bench top, as I’d imagined there’d be, but a full gas oven. The lounge had some worn but quite comfy seating, with loads of cushions and a small coffee table. The bathroom was basic but had a vanity, large mirror and flushing toilet. Sweet! We sat, pleased to finally be there, and ate our packed lunches at the picnic tables provided (including a small kid sized one that my children loved). Our tent took a while to put up. The wind was determined to see it fly and we were determined to pin it down. Having the added challenge of turning the complicated three room thing in the right way again, in gale-force winds, was… interesting. 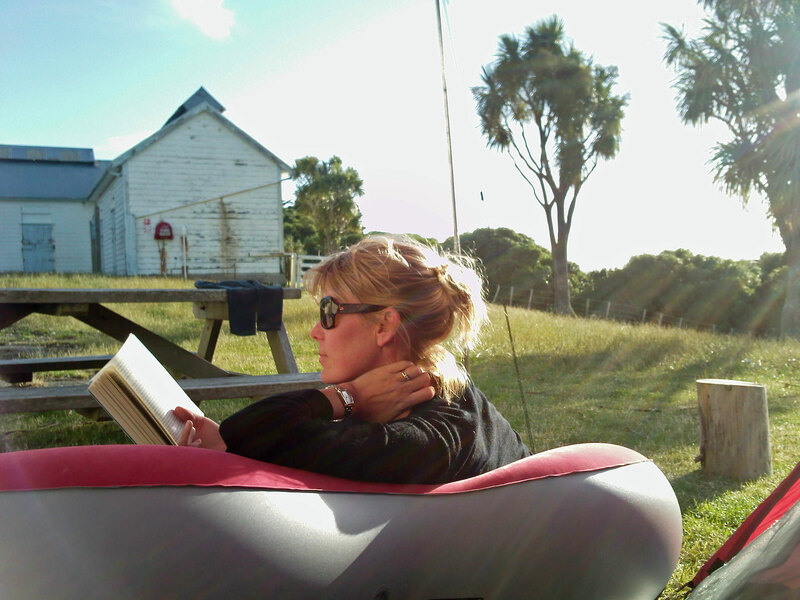 And yes, it was my fault that we’d bought our big tent over to the island. We have a smaller, and in hindsight much more appropriate, tent at home. It is the one my husband would’ve chosen to bring if I’d let him, but no, I wanted the luxury of three rooms and a standing height stud thank you. Hmmm. Anyway, we got there in the end and the kids were, as always, excited to set up our little home with places for torches, clothes, relaxing and sleeping, which the younger kids and myself tested almost immediately (the place for sleeping that is). 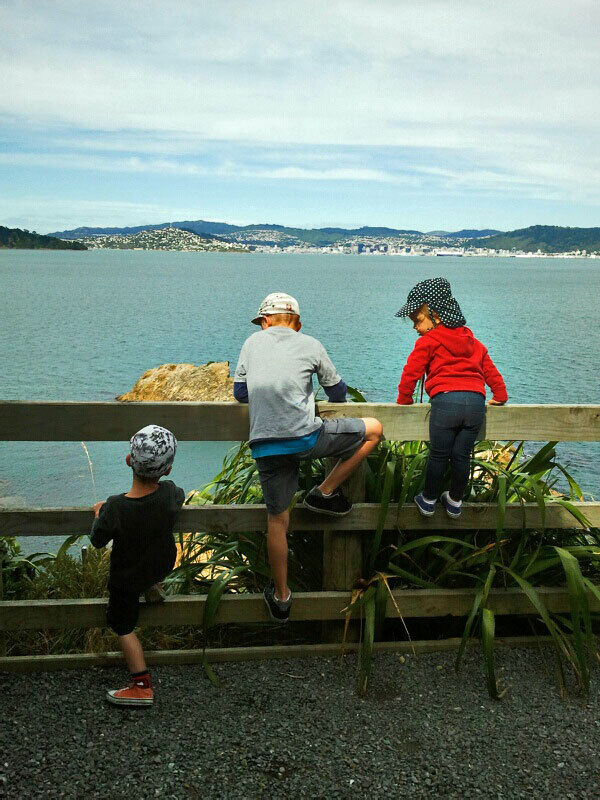 We were keen to head out at night to see some of the island’s nocturnal wildlife (little penguins, weta and tuatara) so having afternoon sleeps was necessary for my normally in bed by 7 pm littlies. And my excuse was… I’m on holiday – afternoon siestas just go with the territory. Admittedly I didn’t actually get much sleep – the wind poked, pushed, pulled, and generally bullied, the canvas of our tent mercilessly. The kids slept like the dead. It was exciting to be at the waters edge at dusk. 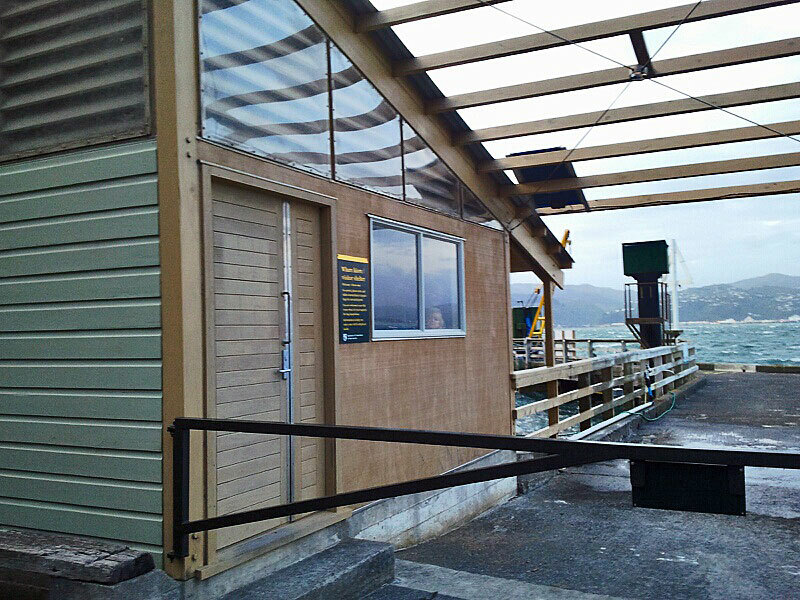 The waves were crashing right over the picnic table down by the wharf and the seagulls were flying backwards. Unsurprisingly, there was no one else about. We spent a happy hour or so looking for penguins, playing hide and seek with the wind (it always found us) and enjoying each other’s company in the area Ranger Jo said the penguins could sometimes be seen. I wasn’t sure how my three year old would cope with the walk, the wind, and the lateness of the hour, but I shouldn’t have worried. Despite not seeing penguins there wasn’t a single complaint from anyone. We had a great time and, miraculously, everyone walked, all the way there and back, without a single “mummy carry” from the little miss. That night was wild. Stupid, mad wild. I thought the tent might break as the walls bent crazily in on us. The rain started. Needless to say, hubbie and I didn’t get a lot of sleep. The kids, once again, slept like the dead. The next day dawned fine. We spent breakfast time crowded around the warm sunny dining room table in the campsite kitchen pouring over a map of the island and planning our adventures. The older boys had already explored a fair bit of the island (while we slept the previous day) but were excited to revisit and show us around. The views from the island were amazing. 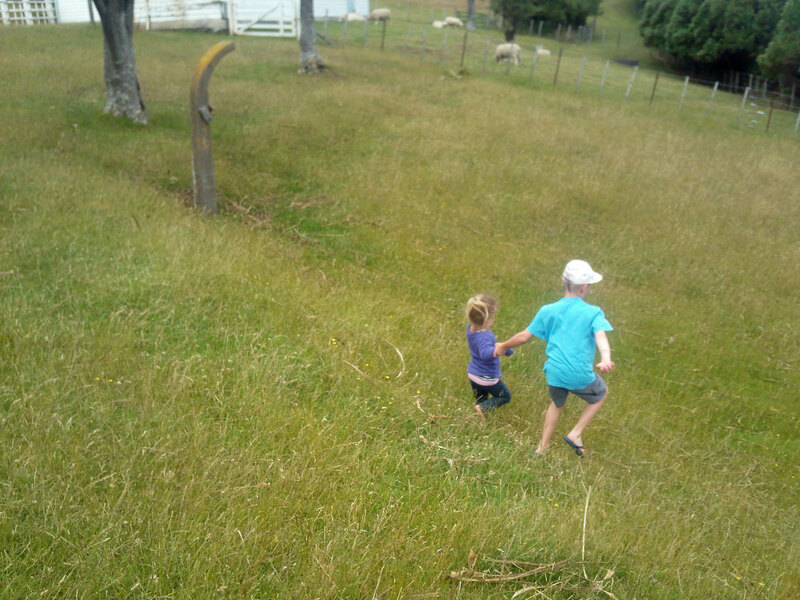 Spotting kākāriki/red-crowned parakeets flitting in the trees, and skinks sunning beside the paths, brought squeals of excitement from us all. The island isn’t big. Spending a couple of hours out and about and then easily being able to get back to base camp for meals, play and relax time, was great. Sleep was much easier to come by on our second (and last) night, and our last day on the island dawned a picture of perfection. As we relaxed into a leisurely pack up another family arrived to set up camp (the only others since the teenagers departed). Down on the wharf the place was bustling with day trippers. Ranger Jo was on the phone to the ferry company. They keep a strict eye on the numbers of people on the island. It was reaching capacity for the day and it looked like they’d have to stop selling tickets soon. Hearing that made me feel happy. It made me happy that people knew about this beautiful island sanctuary and were making the most of it. It made me happy to work for DOC who look after the island on behalf of all New Zealanders (with lots of volunteer help). 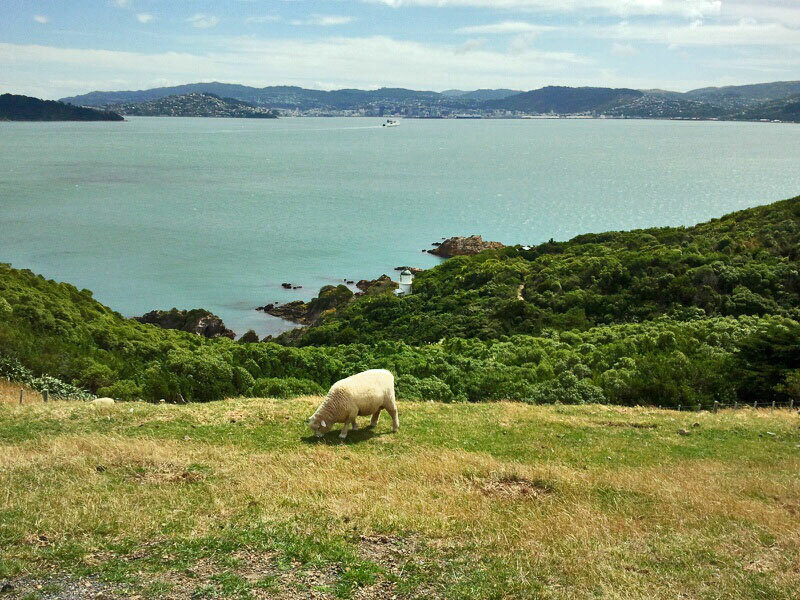 It made me happy that it was right here – a short ferry ride away from the bright lights, buildings and bustle of New Zealand’s capital city – my home. Well, summer’s almost over, but it’s not over yet! While the sun comes down earlier now than it did in Feburary, there are still some secret little havens around the country for you to enjoy the setting sun with your family and friends. The great thing about these spots is that they’re often nice and quiet, and to be honest I’m a little loathe to let you in on the secret! 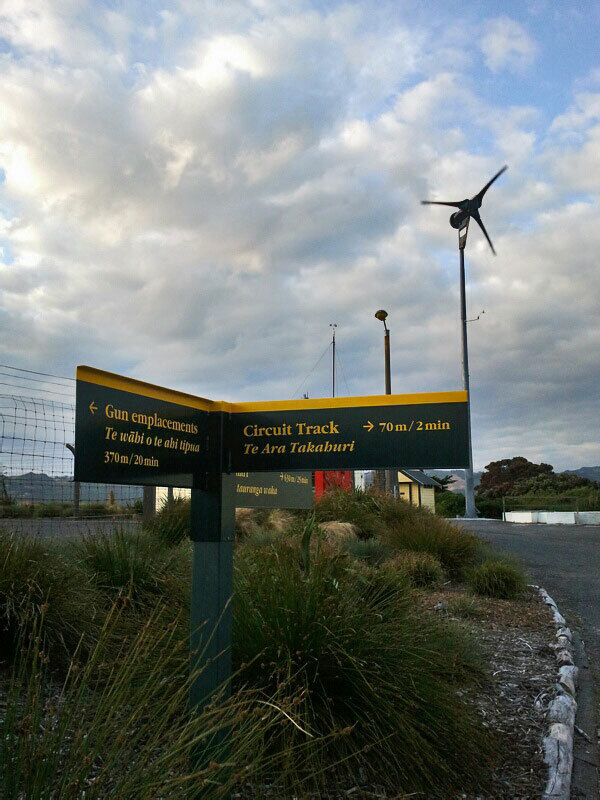 But we do manage these places for you, the NZ public. So before everything gets cold and dark, you could try one of over 200 DOC Conservation Campsites around the country, located in some very special places. 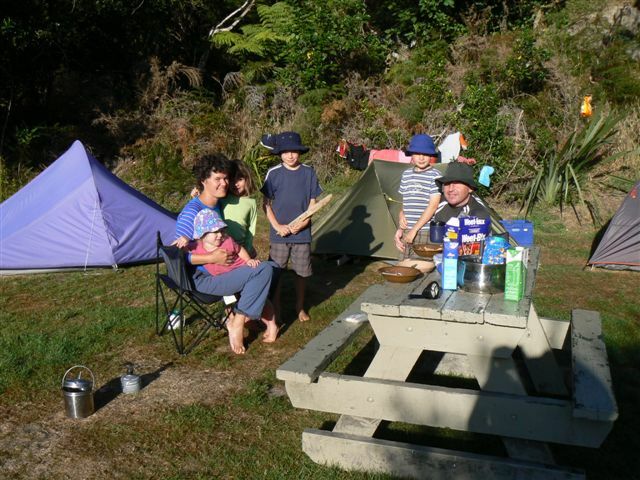 Camping is a fantastic family activity. Sometimes they may be hard to find, but many campsites are in spectacular locations, just waiting for you to find them. You can download the comprehensive North and South Island brochures from the DOC website, or drop into any DOC visitor centre if you’re after a hard copy to chuck into your glove box. One of our many campsites available to the public.